By the end of the 2015-2016 City Championship series, almost every Yveltal player in the United States moved over their Yveltal lists to variants that played Maxie’s Hidden Ball Trick to be able to play Archeops NVI and Gallade BKT. This combo was too good to pass up in the formats that it spawned from. During this time, Vespiquen/Flareon was widely considered the BDIF in Expanded, and it could be hard countered by Archeops NVI as players weren’t yet playing Wobbuffet PHF in their lists. M Manectric EX was also pretty popular and Gallade gave Yveltal EX decks a hard counter to what had previously been a poor matchup. Prior to the Yveltal EX/Maxie’s decks, players typically partnered Yveltal EX with Seismitoad EX, Darkrai EX, and Yveltal XY. They used Hypnotoxic Laser and Virbank City Gym to get additional damage. When players began playing Yveltal/Maxie’s, the original variants of the deck played Hypnotoxic Laser and Virbank City Gym for added damage output. With the aide of these cards, Yveltal EX could OHKO most Pokemon fairly easily. 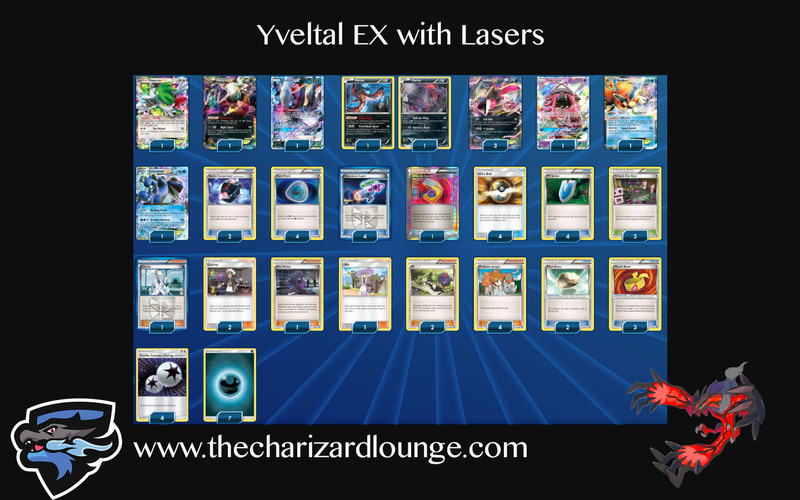 Daniel Altavilla and Brad Curcio both won Regional Championships using Yveltal/Maxie’s lists with the LaserBank combo during this time period. When BREAKpoint came out, we began seeing LaserBank come out of lists and players start to play cards like Parallel City and Silent Lab instead. There were a few things that led to this switch. First, players dropped Muscle Band for Fighting Fury Belt, which made it slightly more difficult to reach OHKO numbers. Secondly, players began incorporating Yveltal BKT into their lists which could setup knockouts for you with its Pitch Black Spear attack. Formats at this time were still largely based around EX Pokemon, so there was plenty to spread damage to with Yveltal BKT. Archeops NVI was banned, weakening Yveltal/Maxie’s. Darkrai GX was released in Burning Shadows, giving Dark decks a new attacking option. While I cannot say with certainty that these two impacts to Yveltal decks cause a reason to greatly overhaul how these decks are being built, I do think it forces us to question whether we should do anything different with how we are building these decks. It is possible that there is a schism that develops among Yveltal players where we get two different camps of players playing drastically different sub archetypes of Yveltal moving forward. I think it is entirely possible that some players continue playing Yveltal EX/Maxie’s lists, just taking out Archeops for something new, while other players play entirely new Yveltal EX builds. I personally am in favor of moving on from the Maxie’s engine and going back to a LaserBank variant of the deck. The LaserBank package makes it extremely easy for Yveltal EX to OHKO most Pokemon, and Yveltal EX being a constant OHKO threat is very strong. In this article I go over my list for my new Yveltal EX/Lasers list and go over my card choices for the list. I believe that Yveltal EX is still extremely strong, having mostly 50/50 or better matchups, and I think this is the way that it’s best played now. Yveltal EX is the primary attacker in the deck, being used for both its Evil Ball and Y-Cyclone attacks. With the Muscle Band and LaserBank combination added back into the deck, Yveltal EX’s Evil Ball attack is truly frightening. An Yveltal EX with a Dark Energy, Double Colorless Energy, and Muscle Band attached to it is doing a base of 100 damage with Evil Ball. If you play Hypnotoxic Laser and have Virbank City Gym in play, you are doing 130 damage. This means that if the opponent has two Energy attached to their Pokemon, you’re doing 170 damage, and if they have three Energy, you’re doing 190 damage. These are great numbers to hit off such a common combo when you consider that a deck like Volcanion EX, or a Lapras GX deck will always have three Energy attached to their primary attackers. When you can’t score a OHKO, you should typically be looking to Y-Cyclone to setup a 2HKO. Y-Cyclone has the added benefit of conserving some of your Energy, in case the Active will be knocked out next turn. This Energy conservation with Y-Cyclone is important for setting up the very large Evil Ball attacks with multiple Double Colorless Energy attached to a single Yveltal EX. Darkrai EX is primarily in the deck for its Dark Cloak Ability, which gives anything with a Darkness Energy attached to it free retreat. It is also used as a backup attacker in the deck. While it’s Night Spear attack has become weaker relative to some other cards the past few years, it can still be a very effective attack. With Muscle Band, Darkrai EX becomes very effective at knocking out Shaymin EX, so you can use Night Spear in situations where you have a Muscle Band attached to knockout a Shaymin EX while sniping elsewhere. This can be used to finish off (or to setup damage on) a Pokemon EX/GX that needs knocking out, or it can also be used against something like Night March to take a three prize turn by knocking out a 30 HP Joltik. Darkrai GX brings a very powerful backup attacker into Yveltal EX decks. Both of Darkrai GX’s attacks are very strong in this deck. Dark Cleave does 130 damage, which is a very significant numbers. This makes it so Darkrai GX is able to OHKO most non-EX/GX Pokemon. This reaches up to 150 damage with Muscle Band, and 180 damage with LaserBank, which is good to OHKO most EX and Basic GX Pokemon, falling 10 short on a few things like Turtonator GX or Lapras GX. Yveltal EX is great for knocking out Lapras GX, and you can use Darkrai GX’s GX attack to deal with Turtonator GX. Its Dead End GX attack is great. It gives you a once per game out to knocking out any giant threat on the opponent’s field as long as you have a Hypnotoxic Laser to play during your turn. This attack should usually be saved for when you have to clear a large threat from your opponent’s field that you otherwise wouldn’t be able to knockout. If you can use Dark Cleave for the knockout, for example, it’s best to save the Dead End GX for later. I’ve seen plenty of games online already where my opponents used their Dead End GX in situations where they could have used Dark Cleave for the same effect. Part of the beauty behind Darkrai GX is that it helps power itself up too. Its Restoration Ability has it put itself onto your bench from the discard pile and then attach a Darkness Energy to itself. This makes it so you can power up Darkrai GX in a single turn with a Restoration, a Dark Patch, and a manual attachment. I think only playing 1 copy of the card is the correct call. Part of the reason for this is that if it’s knocked out, we can get it back from the discard pile with Restoration and power it back up in a single turn. Being able to both play an integral part of your strategy with multiple uses within a single game, while only taking up a single slot in our 60 cards decks makes Darkrai GX an excellent card. Yveltal XY is a classic inclusion in Yveltal decks, but was taken out of lists around the same time LaserBank was taken out of Yveltal lists. Now that we’re putting LaserBank back into the deck it makes a lot more sense to play this card again. With a Muscle Band and LaerBank you can do Oblivion Wing for 80 damage (110 coming back into your turn), and then 190 going back into your opponent’s turn with a second Oblivion Wing which is good for a 2HKO against most Pokemon. With some lucky flips for sleep on Hypnotoxic Laser or by an opponent’s inability to knock it out, you can take down EX/GX Pokemon with this card all for a single Darkness Energy. Even outside of these situations, with LaserBank, Yveltal XY is great for softening up something for a knockout, or finishing something off that you previously damaged. With Seismitoad EX/Giratina EX coming back in Toronto, Oblivion Wing could become a little bit more important as it can recover some of the Energy that this deck will remove with its disruption Trainers. It also serves as a good one prize attacker against Night March decks. Fright Night Yveltal is getting a little less love these days as we move towards a format with more GX Pokemon, which Pitch Black Spear will not snipe to, but I think most criticism of this card is misguided and that it still belongs in Yveltal lists. The Expanded format is still heavily EX based, so in a lot of the matchups Pitch Black Spear will still be at its most effective. I think Fright Night is still relevant even if we move away from EX Pokemon as long as people are playing Fighting Fury Belt in Expanded. It’s not too uncommon to only do like 200 damage to a Pokemon with Fighting Fury Belt, not getting the knockout. However, by promoting Yveltal, the Fright Night Ability shuts off the effect of the Fighting Fury Belt causing that Pokemon to get knocked out. This aspect is even better now as it’s much less awkward to use now that we have Guzma. In the past, players would mostly be restricted to promoting Fright Night after one of their Pokemon was knocked out, or retreating into it and attacking/passing with it active. Now with Guzma we have more access to pulling off a double switch turn, allowing us to retreat into Fright Night to take these knockouts and then also switching into a more preferred attacker. Fright Night also gives Yveltal decks an out to pick up wins against Primal Groudon EX decks. Without Fright Night, Primal Groudon EX will win almost every time. Primal Groudon EX does play counter plays to Pitch Black Spear with Mr. Mime and Pokemon Center Lady, so often your efforts will be for naught, but Fright Night does open up a possible avenue for winning the matchup. Another classic inclusion in Yveltal EX decks, Seismitoad EX is back. Its Quaking Punch attack hits for the same amount as Yveltal’s Oblivion Wing, so the damage math for that card also applies to Seismitoad EX. With how strong Item lock is against the Expanded meta, Seismitoad EX with LaserBank is a strong force being able to take 2HKO’s on most relevant Expanded Pokemon. If I have the means to, I will generally make Seismitoad EX my opening attacker in most games. Item Lock slows down my opponent giving me more time to setup my field, and with LaserBank, Seismitoad EX can take lots of early game knockouts while I load up my Yveltal EX’s with lots of Energy to impose the strength of Evil Ball on my opponent’s Pokemon. Seismitoad EX can be very strong against Volcanion EX decks, being able to OHKO a mini Volcanion with Muscle Band and LaserBank, while easily 2HKO’ing Volcanion EX’s. It’s not perfect though, as it is possible for them to Steam Up twice, Blacksmith, and then OHKO your Seismitoad EX. However, they will need to draw into this, and Item locking them does make it more difficult to pull off this combo. Seismitoad EX is also very strong against Night March and can play a useful role in many different situations in this matchup. If Night March gets a stumbling start, using Quaking Punch at the first opportunity will likely cause them to outright lose the game in a bad fashion. In the late game, you can N them to a low number and Quaking Punch and hope that they dead draw in games where you’ve fallen behind. Sometimes you use Seismitoad EX to control the tempo of a game. If your opponent only has 7 or less Night Marchers in the discard pile, you can use Quaking Punch to allow Seismitoad EX to trade two prizes for two prizes while simultaneously denying your opponent the opportunity to play Puzzle of Time or Special Charge to get additional Double Colorless Energy back into their hand or deck. Item locking Night March also makes it so they have less control over the execution of their game plan. With less access to the cards in their deck they’re forced to play down whatever they draw into. If they only draw Joltik, they have to go with that, and if that’s the case you may be able to setup a situation through the Item Lock where you’re able to get a turn where you Night Spear for three prizes (Shaymin EX + Joltik double knockout). Seismitoad EX is also a solid option for regulating other Seismitoad EX decks, especially if you can get a Float Stone onto your Keldeo EX during the first turn of the game and protect that Float Stone from being discarded by a Startling Megaphone or Field Blower. This prevents you from losing turns to their Hypnotoxic Laser in the early game, as they can’t play them, and against Seismitoad EX/Giratina EX decks, you also lock them out of being able to use their Crushing Hammers and Enhanced Hammer against you. They can still remove your Pokemon Tool and Energy cards with Team Flare Grunt and Xerosic, but they only get one good go at that, and if you have another DCE attachment when that happens you will mostly nullify them as they then have very low probabilities of drawing another of these Supporters. By locking down opposing Seismitoad EX, you buy yourself extra turns to get Energy onto Yveltal EX’s to swing hard into the opponent’s Seismitoad EX’s. There are loads of other uses for Seismitoad EX that are very game specific. Item lock is a very powerful tool to keep in your tool box, and there are lots of game situations that develop during a tournament where locking your opponent out of Items will be your optimal line of play. I’ve always been a big fan of Keldeo EX in Yveltal decks, and I think it will be especially strong in the upcoming format. I foresee Hypnotoxic Laser becoming a much larger portion of the format than it has been and Keldeo EX gives you a way to get out of the Poison and Sleep conditions that this card may inflict. I know players will say that you already have Guzma as an out, but there will be plenty of times where you would rather play some other Supporter cards, and against Seismitoad EX decks (one of the primary Hypnotoxic Laser users) you won’t have the option of using a VS Seeker for easy access to Guzma. A couple of the other reasons why I play Keldeo EX are that it allows me to have full mobility of my field without having to play down a Darkrai EX against Fighting decks and it is good for transitioning out of Seismitoad EX to a different attacker in turns where I need to play something other than a Guzma. This is a replacement of Jirachi EX from previous lists. Tapu Lele GX is a superior card to Jirachi EX for this deck. The only decks that would still have an argument for playing Jirachi EX over Tapu Lele GX in Expanded are decks that are playing Level Ball (as you can get Jirachi EX with its 90 HP with that) or decks playing Hoopa EX (as you can get Jirachi EX with Scoundrel Ring because it is an EX Pokemon). As far as my list goes, we only play 4 Ultra Ball as a search card for either of these Pokemon, so Tapu Lele GX is the better choice for its higher HP and because it can serve as a backup attacker. Tapu Lele GX’s Energy Drive is a solid attack in this deck as well, it’s a tad weaker than Evil Ball, but it can be setup easily, only needing you to attach a DCE to do so. With Muscle Band and Hypnotoxic Laser it can easily 2HKO most Pokemon. I try to avoid playing this down as much as possible, and usually go for Tapu Lele GX as my first consistency out off an Ultra Ball, but I still think Shaymin EX is too good of a card to cut it completely from lists. Tapu Lele GX is excellent for ensuring that you have some draw for your turn, but Shaymin EX lets you get extra draw, and extra draw beyond your Supporter for turn can be huge for either making a big play to finish off a game, or for being able to pull off a play that maintains your prize advantage in a game. It’s also always a great card to see or be able to Ultra Ball for after your opponent plays a late game N on you. This is the best Supporter card in the format and should be played as a 4-of in most decks, outside of some of the most Battle Compressor heavy decks and a few other exceptions. It has particular synergy with this deck as you want to discard your Energy and Darkrai GX to accelerate them with Dark Patch as far as the Energy goes, and Restoration with Darkrai GX. This is the best disruption Supporter card in the game. Limiting your opponent’s resources as the game goes on is one of the best checks you can put on your opponents. When paired with Seismitoad EX, a late game N can be especially devastating as your opponent won’t be able to use any Item cards, such as VS Seeker, and convert those into draw supporters forcing them to actually draw into a Supporter card or Pokemon with a draw/search Ability if they want to keep drawing. This deck and many others in Expanded format have a tendency to get full benches so Colress is great for seeing lots of resources from your deck. In some cases it only nets you the same amount of cards as Professor Juniper, but it can be the better choice in a given turn as it allows you to shuffle resources back into your deck and not discard them. In many instances discarding cards is fine, but sometimes you will want to conserve your Dark Patches or Hypnotoxic Lasers for later in the game. As strong as Colress is, I can’t bring myself to play it as more than a 1-of because of how detrimental the card is as an early game draw Supporter before the benches balloon to large sizes. Colress for 10 is super cool, but Colress for 2, not so much. I think Lillie is one of the most underrated Supporter cards in the format right now. It is always a good card to see in your opening hand because on turn 1 you get the boost of being able to draw up to 8 cards, which is very powerful. It is also good to see in the late game after your opponent plays N as it will draw your hand back up to 6. I didn’t have this in my earliest revisions of the list, but arrived to it after lots of testing without it. When I played a list with 3 N, I too often would draw into N after my opponent’s late game N’s and fail to draw the resources I needed to close out a game. When I played a list with 2 Colress instead, I would then see Colress too often in my opening hand where it wasn’t very strong. Lillie is a great compromise between both of these cards, improving the opening game consistency over another copy of Colress, while improving the late game consistency over another copy of N.
Abilities have always been strong in this game and Hex Maniac gives Yveltal EX decks a very strong means for temporarily locking Ability based decks. While a continuous Ability lock with Garbotoxin is very strong, this deck often doesn’t need that strong of an Ability lock against most decks. A turn or two of Ability locking is all you need to pull ahead in a game in most of the Ability based matchups. Some of the most common uses of Hex Maniac are to stop Energy acceleration against Eelektrik and Blastoise decks, stopping Giant Water Shuriken against Greninja BREAK decks, and preventing Volcanion EX decks from landing a OHKO on you by shutting off their Steam Up Ability. You can also use it to break Trevenant’s Item lock for a turn. It also plays some role in stopping Abilities like Hoopa EX’s Scoundrel Ring, Tapu Lele GX’s Wonder Tag, and Shaymin EX’s Setup. Against decks dependent on these types of Abilities for their Engine (such as M Rayquaza EX), Hex Maniac could be a strong opening gambit. Later in the game it can also be useful for shutting down such abilities as well, but it’s much harder to nail down when it is effective and when it’s not as you won’t always guess correctly on what resources your opponent has in hand (or get lucky on what resources they have). Guzma is an easy replacement for Lysandre in Yveltal EX decks. You have multiple ways of retreating your Pokemon for free, making it so Guzma rarely is detrimental because of the switching effect when you only want to gust up an opponent’s Pokemon. However, Guzma gives you extra utility, giving you outs to Accelgor DEX and Lapras GX’s paralysis attacks, and another switching option against Trevenant BREAK and Seismitoad EX decks, making it less likely you get something unappealing stuck in the active position against these decks. In this deck, Hypnotoxic Laser is primarily being used to hit higher damage numbers to get OHKO’s with Yveltal EX/Darkrai GX, or 2HKO’s with Seismitoad EX/Yveltal XY when used in conjunction with Virbank City Gym, which increases Poison damage in between turns by 2 damage counters. I think the 25% probability of the opponent’s Pokemon being asleep heading back into your turn is an underrated aspect of Hypnotoxic Laser right now. I think players focus too much on the fact that it’s more likely to not happen than it is to happen, but ignore the fact that 25% is still a pretty significant probability for something with such a strong effect. Another argument I’ve seen against it is that Guzma will be played in almost everything and it can be used to get out of the sleep. This is true, but what is also true is that often times the opponent would be in a much stronger position if they were able to play some Supporter other than Guzma for their Supporter for the turn. I also think people are underestimating how strong Hypnotoxic Lasers base effect is. At its worse, it is PlusPower, with added damage if the opponent doesn’t retreat or switch their active Pokemon out of the active position, or heal the poison off through some other effect. More optimally, it becomes a triple PlusPower when you have Virbank City Gym into play. +30 added damage on your attack is very strong. The sleep effect is very strong as well. Often times doing well at Pokemon tournaments comes down to getting lucky. In other card games, something that I’ve seen to hold more value among the players is cards that give a player an opportunity to get lucky and which can create positive variance for the player. Hypnotoxic Laser is a card with a strong base effect, but which gives players the opportunity to get lucky. Probably the best example of this is the 2015 Fort Wayne Regional Championship finals. Matt Price almost had the tournament won, that is until Frank used a Hypnotoxic Laser on Matt’s Keldeo EX. Matt’s Keldeo EX stayed asleep through three sleep check coin flips, which caused the Keldeo EX to be knocked out by poison headed back into Frank’s turn, allowing Frank to win a game 2 in the series that looked over. Frank would go onto win game 3 of the match and win the tournament. As mentioned above, this makes poison damage place 3 damage counters on the opponents Pokemon instead of 1 between turns. More damage is good, and having 3 copies of this make sit so we almost always see the additional damage off of our Hypnotoxic Lasers as we will have easy access to Virbank. Having three copies also makes it easier to find the Hypnotoxic Laser/Virbank City Gym combo on turn 1 when situations arise to get a donk against Pokemon such as Joltik PHF and Exeggcute PLF. This is our Energy acceleration. A single Dark Patch along with an attachment from hand will power up Yveltal EX to at the least use Evil Ball. A Restoration, Dark Patch, and attachment powers up Darkrai GX to attack. This is the lifeblood of the deck and what has made Yveltal EX such a strong archetype in the Expanded format. We’re not playing the Maxie’s engine in this variant, but Battle Compressor is still very strong in the deck. It puts Darkness Energy into your discard pile to be accelerated with Dark Patch, and also helps get your Darkrai GX into the discard pile. It also still useful for putting the exact Supporter you want to use in the discard pile to be gotten with VS Seeker as well as to clear dead cards out of the deck. This is my favorite Ace Spec for Yveltal EX decks. In the Maxie’s lists I prefer Computer Search as it’s helpful for pulling off the Maxie’s combo, but in this variant I’m not worried about pulling off a complex combo, so there is more freedom on what you can play. I love Scramble Switch as it allows me to maximize my Energy attachments and seamlessly transition into the preferred attacker for a turn. It gives me both the opportunity to consolidate two Pokemon into one as far as Energy is concerned, which is very strong as Evil Ball can grow to massive damage amounts when you do this. It also allows you to go in with a big Evil Ball, and if that Yveltal EX isn’t knocked out, I can use Scramble Switch to transition into an undamaged Yveltal EX to try to further prolong that Energy’s usefulness, or use Scramble Switch to distribute the Energy between the original Pokemon and a new one. Outside of using it for its main effect, Scramble Switch gives the deck an additional switching effect. In combination with Darkrai GX’s Restoration Ability it can also act as a Pseudo Dark Patch for any of your other Pokemon. I had Choice Band in my first revision of this deck, and it became very apparent very fast that Choice Band wasn’t all that great in the Expanded meta. With Night March, Trevenant BREAK, Garbodor, Greninja, Raikou, mini Volcanion, and other one prize attackers used in the Expanded format, it became obvious in too many matchups Choice Band was a dead card. Muscle Band is 10 damage worse against EX/GX Pokemon, but 20 damage better against non-EX’s, and with the commonness of these non-EX Pokemon in the format it became obvious that taking the balanced approach with Muscle Band was the correct route to go. Fighting Fury Belt is also another option. I think it’s probably more correct than Choice Band, but definitely worse than Muscle Band in this format. I think Tool removal will be much heavier in this upcoming Expanded format than the past few. Field Blower is a card that players are better incentivized to play than previous Tool removal cards as Field Blower can also act as a Stadium countering card. Tool Drop also has moderate hype and that should also help lead to more Tool removal seeing play. One of the things I hated most about playing most Yveltal EX/Maxie’s lists were that they lacked solid access to a turn 1 retreat, which often meant you weren’t attacking on the first turn of the game. With 2 Float Stone as well as Scramble Switch, this list is pretty good at getting you into a turn 1 attacking option allowing you to push up the tempo of the game. Getting a Float Stone down on Keldeo EX can also be very strong against Item lock decks such as Seismitoad EX/Giratina EX or Trevenant BREAK, preventing you from getting something suboptimal stuck active as well as allowing you to remove the Poison status condition if a Seismitoad EX uses Hypnotoxic Laser against you. Float Stone also allows you to have a field full of free retreat without a Darkrai EX DEX in play. This can help you keep a two prize liability off your field against Fighting decks that may not otherwise be able to take a OHKO. My list played 7 Darkness Energy and 4 Double Colorless Energy, which is fairly standard for Yveltal decks. Having access to the maximum of 4 DCE is important as that boosts up your Evil Ball attack damage by +40 compared to the +20 provides by a Darkness attachment and DCE is also good for powering up Seismitoad EX in this list. 7 Darkness gives you good access to Darkness Energy to draw into as well as Darkness Energy to discard and accelerate with Dark Patch. Here are some cards that could theoretically go in this deck that people may be wondering about that I have excluded from it. This was in my original revision of this deck, but I grew to hate the card and ended up cutting it out for additional consistency. The Night March matchup seems fairly close without it, so I don’t see the point of hard teching against something that will probably make up no more than 10% of the meta game at the average Regional Championship. In a local meta game, if you know Night March is popular it may be worth the space, but in a Regional Championship it probably does more harm to your tournament performance than the good it can provide on the off chance you get paired against a Night March deck. What would happen when playing this card is that I would draw into it off of late game N’s, or draw into it in my opening hand. It became silly seeing this card when it could become another draw Supporter that more universally helps my deck function against the meta game at large. You can Battle Compressor it away, which would prevent the late game scenario, but this often isn’t an option. At only two Battle Compressor you will typically want to use the first one to discard some Darkness Energy to accelerate with Dark Patch. Then Darkrai GX is another good early game target, and sometimes you have to get rid of a draw Supporter on the first Battle Compressor to get some draw for the turn. If you don’t see that second Battle Compressor and don’t otherwise discard Karen that thing will be floating around in your deck waiting to be drawn into at the inopportune times. Because of this, I think if I were to tech for Night March, I would play Oricorio. Oricorio can be played down onto your bench as a means of thinning it out of your deck. You can’t play Karen down onto your bench to thin it out of your deck. Yveltal decks are pretty solid as is for making Night March a close matchup, so I think Oricorio should make it a pretty safe matchup, even though it’s not a perfect counter. Utilizing Oricorio at the right time is going to be easier to use than to align the Seismitoad EX/Karen combo at the right time. If you don’t have Quaking Punch to pair with Karen, it’s not too uncommon for the Night March player to be able to build up a OHKO immediately after the first Karen of the game, and because of how fast Night March is, taking a OHKO after the first Karen might be what is ending the game. Item lock appears like it is going to be very popular in the early stages of this season’s Expanded format, with Trevenant BREAK and a variety of different Seismitoad EX decks looking like they’re going to be popular. I think it won’t be too uncommon for players to play against 3-4 Item Lock decks during Day 1 of one of the early season Regional Championships, so a card that is going to be dead in too many matchups in what looks to be the likely meta won’t be worth playing. Yveltal XY is better against these Item lock decks, and Oblivion Wing is also a very strong attack damage wise when you pair it with the LaserBank combo. For some reason lots of players are hyped for this card, but it seems way too situational for me to use. It is definitely very strong after a GX attack was used, but the amount of turns in a tournament where this card will have its effect triggered is going to be very low. There are lots of decks that don’t use GX attacks, and for the ones that do, a lot of them commonly use them more towards the end of the game. I don’t think Garbodor will have a large share of the Expanded meta, but it will probably be around 10% of the decks that people play at the early Regional Championships. Therefore, just as we have done in Standard format, in Expanded we can avoid playing this card for more actual Supporter cards to help limit how much damage Trashlanche does to us. With Trevenant BREAK and Seismitoad EX both looking like popular choices from players early on, having more Supporters will also be helpful in these matchups. For this deck I am skipping the matchup section. On the advanced level, this deck I feel like is a big collection of different tactics, and as the Yveltal player it is your job to pick the right tactic based on what your opponent is trying to do in a matchup and what you draw. Based on these factors, what tactics you should go for can vary greatly from game to game. This is very much not a linear deck with easy to explain strategies for many matchups and situations. In my explanation for my card choices I cover a lot of the tactics that I use while playing a deck, so I hope these descriptions and thoughts presented there give players a good idea on how to utilize the deck in various situations. However, on a more simplistic level, this deck can also be like carrying a big stick. Sometimes the tactic you use is walloping your opponent with the big stick that is Evil Ball and if your opponent’s deck doesn’t have a counter measure sometimes hitting them a few times with giant Evil Ball attacks is all it takes to win. Overall, Yveltal EX/Lasers has tested very strongly for me. The deck hits very good numbers thanks to the Muscle Band + LaserBank combo and generally OHKO’s most Pokemon in the format. The addition of Darkrai GX into the deck has been very strong giving the deck an easy out for 180 damage with Dark Cleave, and the added utility of clearing big threats with Dead End GX. The deck isn’t overly imposing in most of its matchups, but most matchups feel tlike they’re around 50/50, with some feeling a little more favored and some others feeling a little unfavored. I’m not 100% on playing this for the Fort Wayne Regional Championship yet, as there is still some more risky and out there stuff that I’m considering. What I am sold on is that this deck should be my fail safe deck for the tournament that I fall back to in case nothing else pans out, or if the meta seems hostile to the other decks I like. What this means as far as testing is that I pretty much split my time between continuing getting repetitions in with this deck as well as trying other stuff to try to hit a breakthrough. I think having a fallback option that you continuously test throughout the process is important, as it allows you to always have something you feel comfortable playing in case nothing pans out for you. This was a great article. I put this together online and Darkrai GX has turned many games with the GX attack and then mops up. I like the Muscle Bands as well and understand the reason for them is your expectation of increased tool removal throughout the meta. That said, are you expecting to see tool removal as more than a 1 of Field Blower? Seems like a lot of games against this deck present the devil’s choice for your opponent if it is built with FFB. Do you remove the FFB, the Float Stone on Keldeo, or the Virbank? If you are expecting Field Blower (or other options) to be found in numbers higher than a 1 of, the worry about losing the FFB seems well founded. The reason I ask this is because Yveltal is so squishy at 170 HP and there have already been a few games where I have thought to myself how much more survivable the deck would be with FFB instead of Muscle Band. And then I get a game where Darkrai GX + MB + Laserbank = insta KO and reconsider. Basically, I would like a little be more on why Muscle Band over FFB. If it is straight up “It allows me to hit OHKO damage numbers that FFB can’t hit” as suggested in the article, then that is cool. Thanks again for the article! I really enjoyed it!